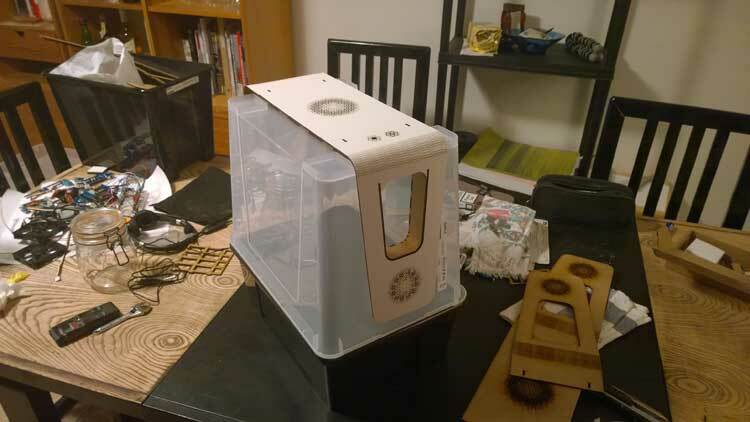 For two years they have been taking their smart greenhouse prototype around Maker Faires and DIY events. 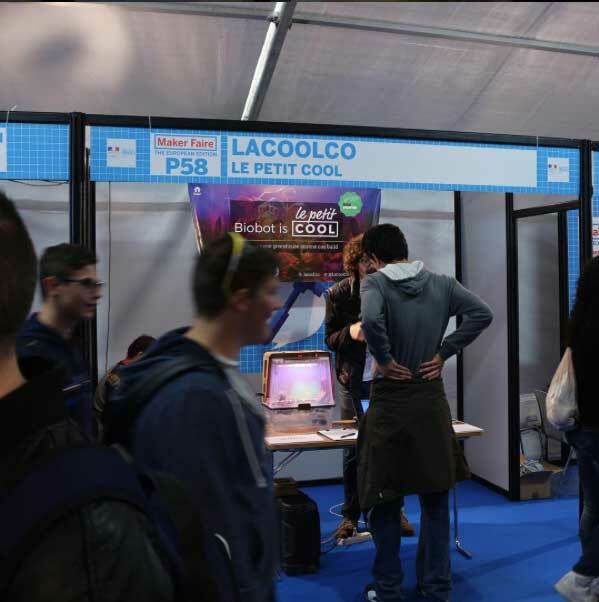 The designers of La Cool Co were at Maker Faire Rome 2015, where they talked about the difficulties of developing an open innovation project in France. La Cool Co and their smart greenhouse prototype were at Maker Faire Rome on October 16-18. Carlos Santana, Antoine Berr and Maximilien Daman will launch in early November a $70,000 crowdfunding campaign to produce 200 “Petit Cool” kits. And soon, they will be in residency at FabClub in Paris, where they can “stop working in the living room or the basement”, as they have been doing for the past two years. 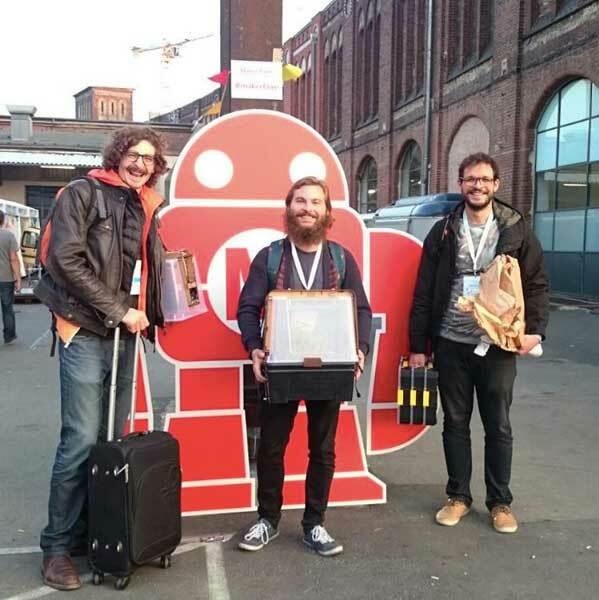 In June 2014, you were at Futur en Seine in Paris to present Biobot. What has happened since then? It was our first time meeting the public. This event came across to us as very business-oriented and corporate. I remember guys from Orange and SFR telling us that the future was about putting SIM cards in our objects… Afterwards, at Maker Faire Paris, Omar Soubra from Make came to our stand with the blue ribbon of merit saying, “You guys, don’t stay here, you’ll never do anything in France. Come to Colorado.” He was the first person to congratulate us for investing ourselves in this project. You are designers, how did this project come about? We’re students at Ensci-Les Ateliers. We worked with Thomas Lommée, who developed the OpenStructures project and who shows students how to use crowdfunding platforms in order to be practically responsible for realizing their ideas. With our first campaign, we managed to raise 2,000 euros to make our first connected greenhouse. We started out with Tupperware, two or three LEDs. Thanks to this money, we were able to develop the project. By now, you’re real globetrotters. What are the main ideas that you’re promoting? For the past two years, we’ve been going around the world to present our project. Above all, we’re trying to make an open source tool so that children and teachers (for example) can develop their skills in both electronics and botany. Today, we’re not selling a product but a kit to observe and nurture the growth of all sorts of plants. Our system is based on open source microcontrollers such as Genuino, which we associate with numerous other open hardware components and sensors. What kinds of elements can you monitor and measure? Light, irrigation, humidity, temperature… It’s like a little weather station. Our tools our freely accessible online, designed to adapt to very different types of plants, and our parameters allow you to very precisely control the dosage of all the necessary ingredients, from germination to the actual plant. Our idea is not to produce our own food, but rather to allow for observation and experimentation, with a platform that pools parameters and results. How do you see the future of your project in France? We’re giving a lot of workshops, in France, in the UK, in the U.S. Our studies aren’t finished yet, but we’ve already realized that France is somewhat blocked when it comes to open innovation. It must be the only country that doesn’t understand that open innovation can be profitable! We are children of the what we call the age of access, and as designers we try to appropriate these technologies. We are no longer creators of objects, but of applications. We ourselves learned everything from the Internet. Two years ago, we knew a little about botany but we didn’t know how to code. With our project, you can build a greenhouse, but also a thousand other things. Why was it important to be present at Maker Faire Rome? First, it’s a great chance to meet other makers. In the past two years, we’ve been to San Francisco, New York, Rome… Now we know people who are developing a similar project, Micro Experimental Growing (MEG). They’re light designers, and we talked a lot about these aspects in developing our own project. Here we can do crash tests that are worth a lot more than market studies. Moreover, now we know how to recognize the guys in suits who are only there to sell, and who don’t engage in this kind of exchange. For the same kind of projects, they’re competitors. You really feel this competitive relationship? How do you justify your commitment to open source? In France, everyone tells us to protect our project. We were supposed to get funding from the Public Investment Bank (BPI), but they told us that because we couldn’t file a patent, it was too risky. We told them that we stood by our principle. Since then, we’ve found a new way to deposit a Soleau envelope. We can easily prove that the project has existed for a long time, we have all the links, all the dated documentation. Most of all, we have a community who recognizes this effort. And so we started our company, in Colorado.